What Effect Does Your ATV Have On Deer? Strangely enough, most hunters know and acknowledge the importance of muffling their voices and covering their scents in a deer stand. From hunting television show hosts to the relative beginner, talking takes place rarely in a stand or blind, and when it does happen it usually verges on inaudible. Why then do so many hunters neglect to address the issue of sound and smell pouring off those big practical beasts called ATVs? An ATV or UTV will affect deer primarily from two angles: smell and sound. While the sight of a big utility vehicle rolling through the woods will undoubtedly catch a nearby deer’s attention, we can assume that we wouldn’t be shooting at bucks we see on our way to our stand anyway, and the only deer the sense of sight will affect are those close enough to see it. The sound of an offroad vehicle brings up bigger problems. Deer have sensitive hearing, but only at very high frequencies. Otherwise, they hear somewhat similarly to us. That said, the rumble of a 500cc (or bigger) engine will still find its way to the ears of any deer within hundreds of yards of its path of travel. Scent may seem the less impactful factor, but it is the longer-lasting one. Think of how you would react to internal combustion taking place within a closed garage. This is probably how a deer, with a much greater sense of smell, would interpret exhaust fumes in the woods. Deer’s sense of smell is hundreds of times more acute than that of a human. Then factor in that smell will linger, and sound will not. Connecting another exhaust onto the stock pipe could create serious long-term problems, and it isn’t recommended unless you have serious knowledge of tweaking carburetion, fuel injection, and ignition systems. Some people might suggest an electric ATV, which will cut down significantly on sounds and scent. The issue is that utility ATVs are meant to be powerhouses capable of getting serious work done, and such is usually not the case with electrics. Also, electric motor doesn’t necessarily mean silent. Some sound will always be the result of power production, unless you’re hunting in a Prius. 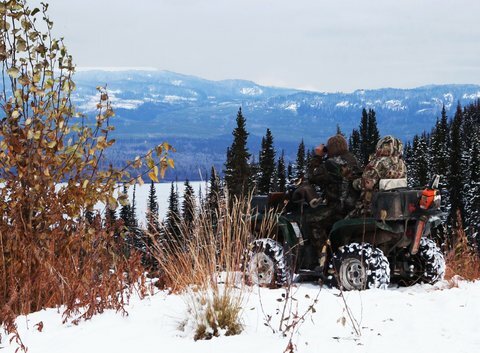 One of the most important factors to consider is the remoteness of the particular area you’re hunting. In areas near highways or farm fields, where auto and machinery traffic is common, deer won’t be as easily spooked. On the other hand, think twice about how deep you want to drive your ATV into remote country, where deer may run off at a pin drop. Really, ATVs are a necessary evil, or more appropriately a necessary practicality. It’s like fishing in a remote area where fish have little exposure to fishing pressure. In order to get to them, you have to accept that your trolling motor alone cannot totally eliminate boat presence and the disturbances it causes on the surface of the water. So the best you can do is service your ATV as frequently as possible. Keep it from acting up and backfiring or running louder than usual, and a don’t allow it to run too rich and intensify the smell of gasoline.